Assevillers is a village approximately 10 Kms south-west of Peronne. Assevillers New British Cemetery will be found at the entrance of the village after crossing the A1 motorway and the high speed train line. 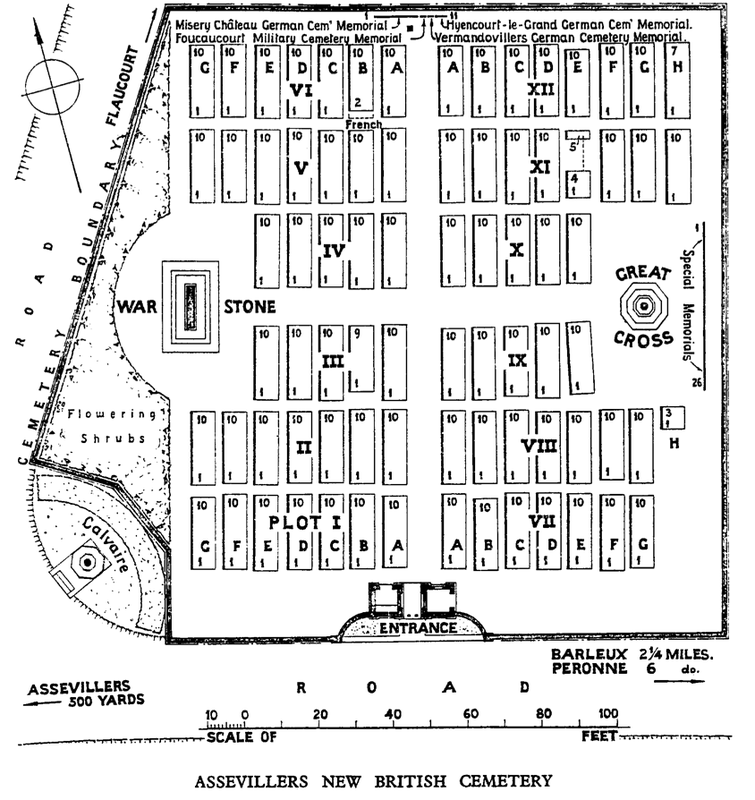 Wheelchair access to this cemetery is possible, but may be by an alternative entrance. Assevillers was taken by the French in the autumn of 1916, evacuated by the Fifth Army on the 26th March, 1918, and retaken by the 5th Australian Division on the 28th August, 1918. 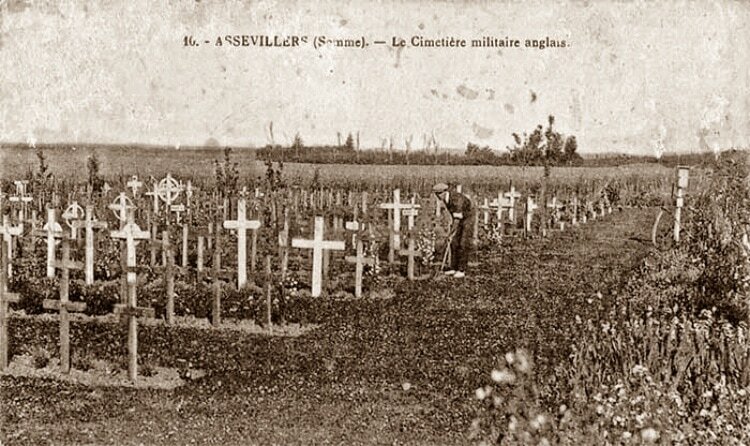 A number of cemeteries were made by the French troops at Assevillers, and in one ("E"), at the West end of the village, 13 soldiers from the United Kingdom were buried by Field Ambulances in February and March, 1917; they are now reburied in Fouquescourt British Cemetery. 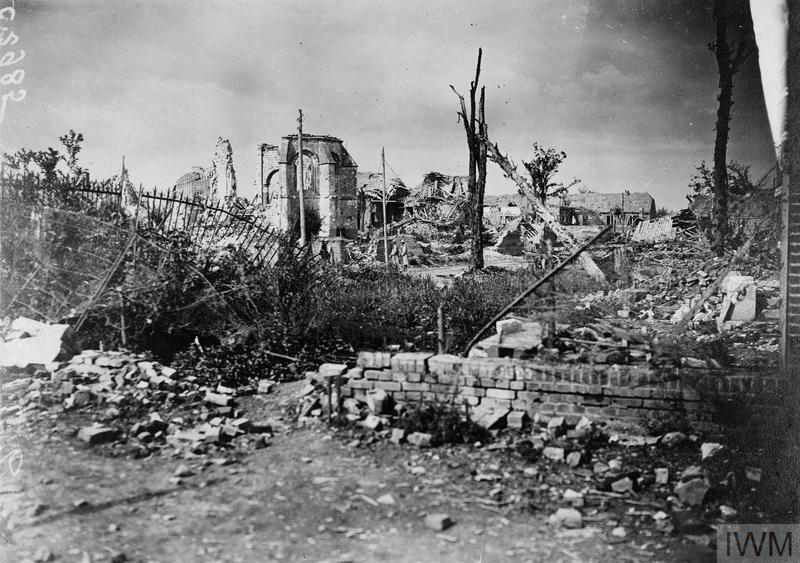 BARLEUX GERMAN CEMETERY, about 365 metres North-East of Barleux, in which ten Australian soldiers were buried by their comrades in August and September, 1918. 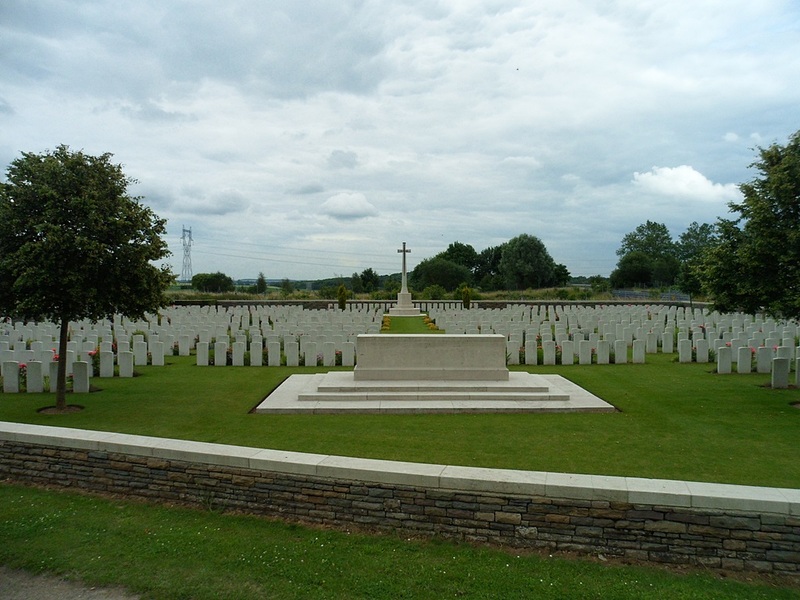 BOUCHAVESNES (or PERONNE ROAD) GERMAN CEMETERY, between Marrieres Wood and Bouchavesnes, in which seven South African soldiers and three from the United Kingdom were buried by the enemy in March, 1918. 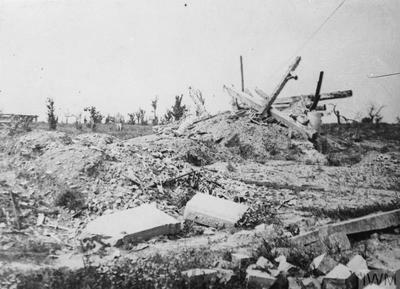 It was at Marrieres Wood that the South African Brigade was annihilated on the 24th March, 1918. ESTREES-DENIECOURT GERMAN CEMETERY, between Estrees and Fay, where two Australian soldiers were buried by the enemy. FOUCAUCOURT FRENCH MILITARY CEMETERY, at the South-West corner of the village, where four soldiers from the United Kingdom were buried in 1915 and 1917. 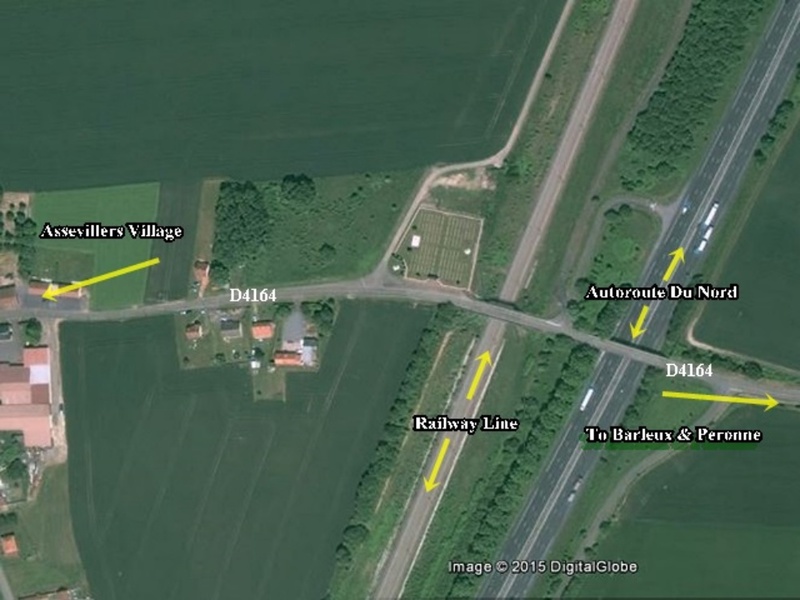 HIGHWAY CEMETERY, CAPPY, a French Military Cemetery midway between Cappy and Herbecourt, where six men of the R.H.A. 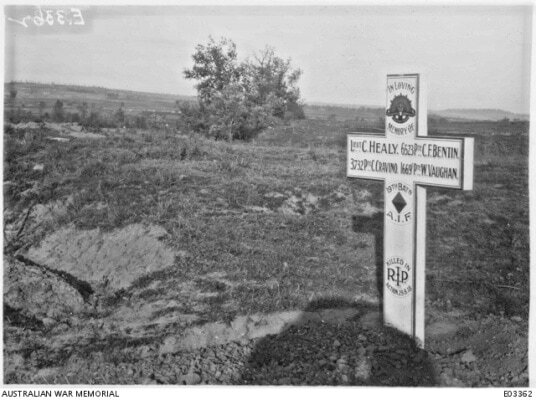 and one Australian soldier were buried in August and September, 1918. 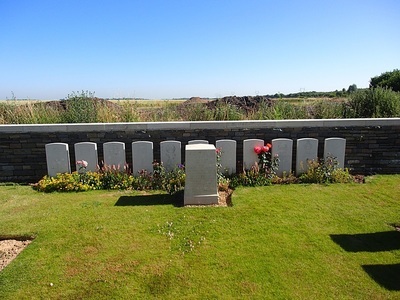 HYENCOURT-LE-GRAND GERMAN CEMETERY, made by the 61st Infantry Regiment on the Chaulnes-Marchelepot road, where two R.A.F. 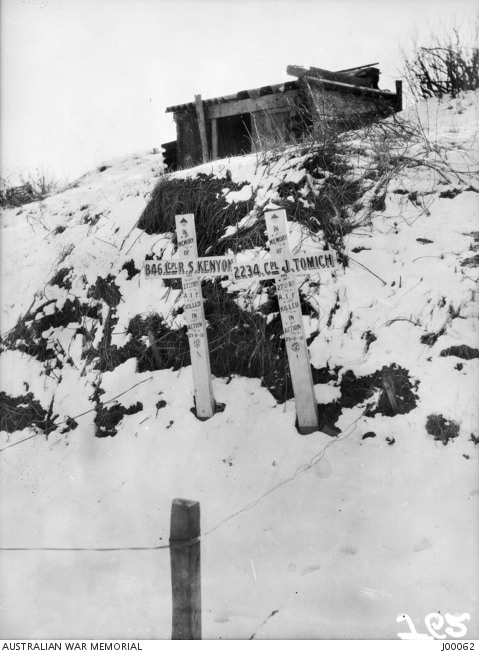 officers were buried in May, 1918. 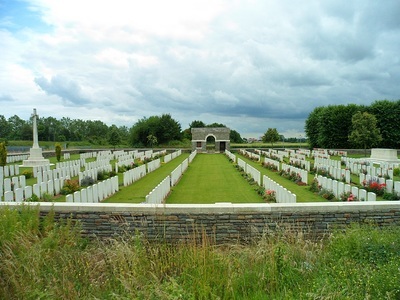 KIBOKO WOOD CEMETERY, BIACHES, by a small copse between Biaches and Flaucourt, where 30 United Kingdom soldiers were buried by the 40th Division in February and March, 1917. 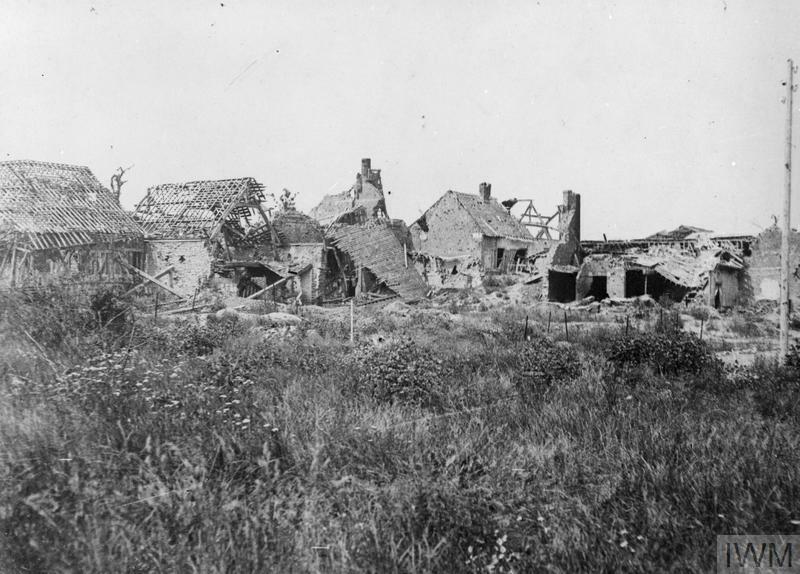 All but one belonged to the Royal Warwicks, and twenty of these to the 1st/6th Battalion. 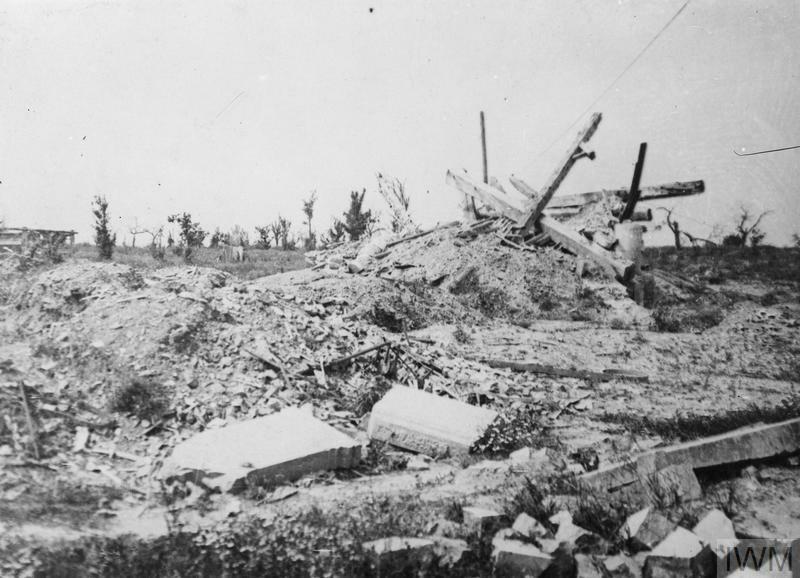 MISERY CHATEAU GERMAN CEMETERY, where 16 soldiers from the United Kingdom were buried by a German Field Hospital in March, 1918. PLANTATION CEMETERY, a French Military Cemetery in the large Orchard 914 metres East of Cappy, where one United Kingdom soldier was buried in February, 1917, and four Australian in August and September, 1918. 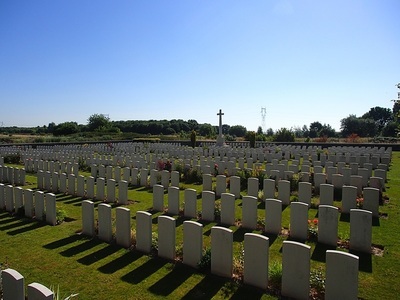 VAUVILLERS COMMUNAL CEMETERY, in which four soldiers from the United Kingdom who fell in March, 1918, were reburied. 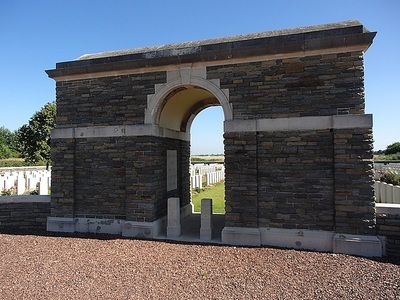 VERMANDOVILLERS FRENCH MILITARY CEMETERY, at the West end of the village, where two United Kingdom soldiers were buried in March, 1917, by their comrades. There are over 800, 1914-18 war casualties commemorated in this site. 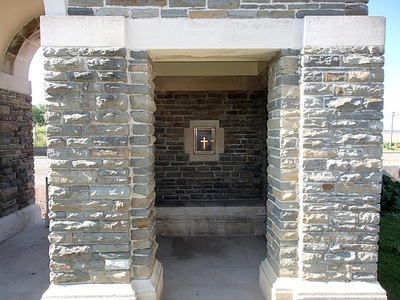 Of these, two-fifths are unidentified and special memorials are erected to 25 soldiers and one airman from the United Kingdom, known or believed to be buried among them. 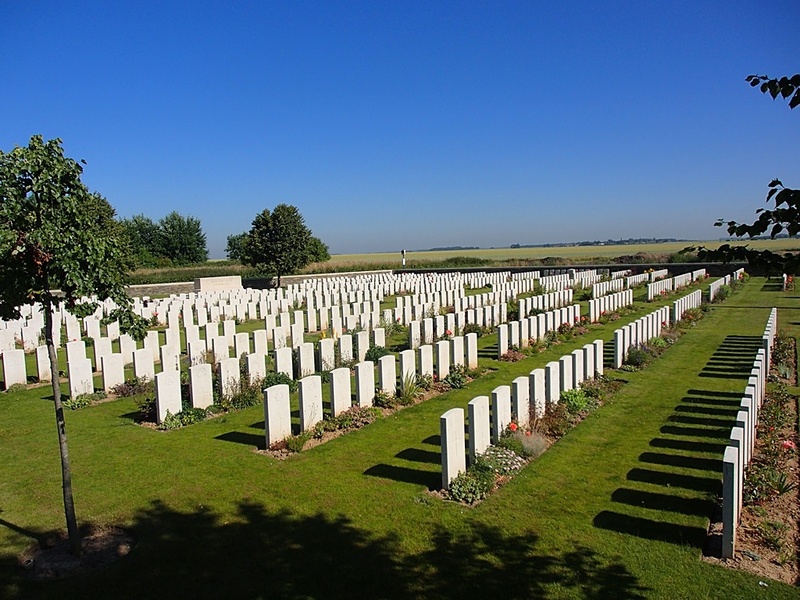 Other special memorials record the names of nine soldiers and two airmen from the United Kingdom, buried in other cemeteries, whose graves were destroyed by shell fire. 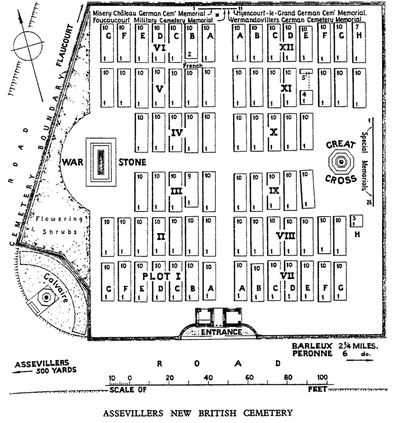 The cemetery covers an area of 2,655 square metres and is enclosed by a stone rubble wall. 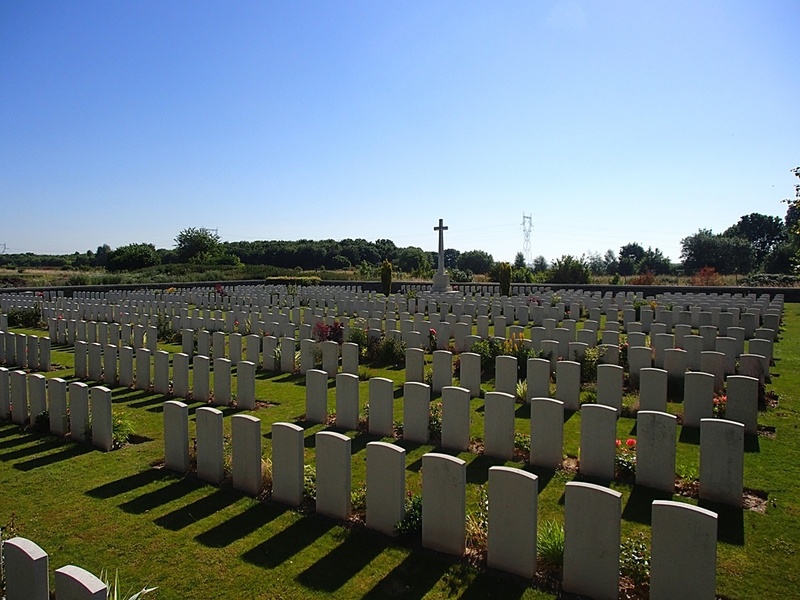 Casualty Details: UK 684, Canada 3, Australia 111, South Africa 16, France 1, Total Burials: 815. Son of Mr and Mrs Amps, Howes Close Farm, Huntingdon Road, Cambridge. 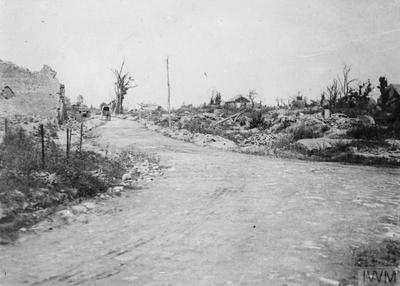 30th Bn. Australian Infantry, A. I. F.
28th August 1918, aged 19. Son of William and Harriet S. Carratt, of "Park View," 56, Burwood Rd., Burwood, New South Wales. Born at Concord, New South Wales. 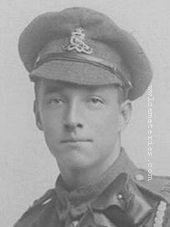 4th February 1917, aged 20. Son of Charles and Eliza Churchill, of Broadwindsor, Beaminster, Dorset. 26th Bn. 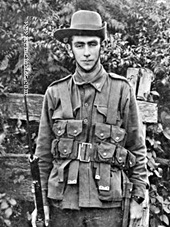 Australian Infantry, A. I. F.
29th August 1918, aged 21. Son of Samuel Hildreth Dobson and Emma Amelia Dobson, of Pine Rd., Penguin, Tasmania. 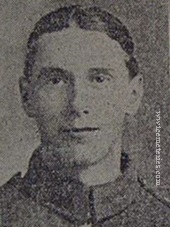 21st March 1918, aged 22. 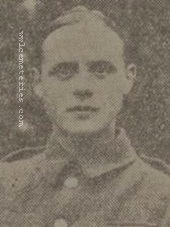 Son of Joseph and Emma Hammond, of 365, Victoria Terrace, Lowerhouse Lane, Burnley. 19th Bn. 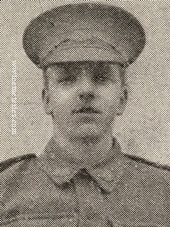 Australian Infantry, A. I. F.
29th August 1918, aged 34. Son of Patrick Joseph and Annie Louisa Healy, of 10, Bligh St., Sydney, New South Wales. 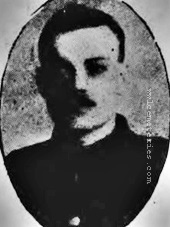 Warrant Officer Cecil Healy, the Australian Champion swimmer who was killed in action near Peronne on 29 August 1918. 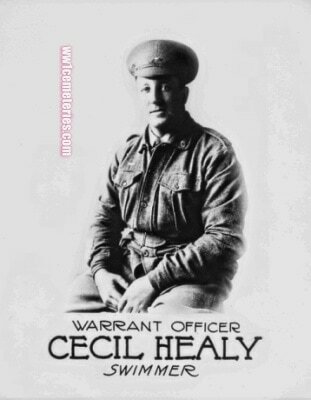 On 15 September 1915 Healy enlisted in the Australian Imperial Force and after service as a quartermaster sergeant in the Army Service Corps in Egypt and France he transferred to the infantry officer school at Trinity College, Cambridge, where he swam, rowed, boxed and played rugby. 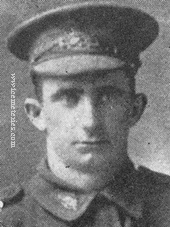 On 1 June 1918 he was commissioned second lieutenant in the 19th (Sportsman's) Battalion and was killed in his first action. Healy won a gold medal at the 1912 Olympic Games in Stockholm in the 4x200 m freestyle relay and a silver medal in the 100 m freestyle events. This slide is one of a series used in a 1917 recruiting campaign to encourage sportsmen to enlist in a sportsmen's unit, such as had been successfully raised in England. The concept was not as popular in Australia. 13th Bn. Australian Infantry, A. I. F.
19th August 1918, aged 25. Son of John Wadham Morgan and Sarah O'Brien; husband of F. Morgan. Born in New South Wales. 4th February 1917, aged 41. 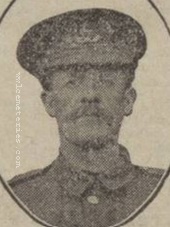 Husband of M. A. Sharratt, of Lower Gungate, Tamworth, Staffs. 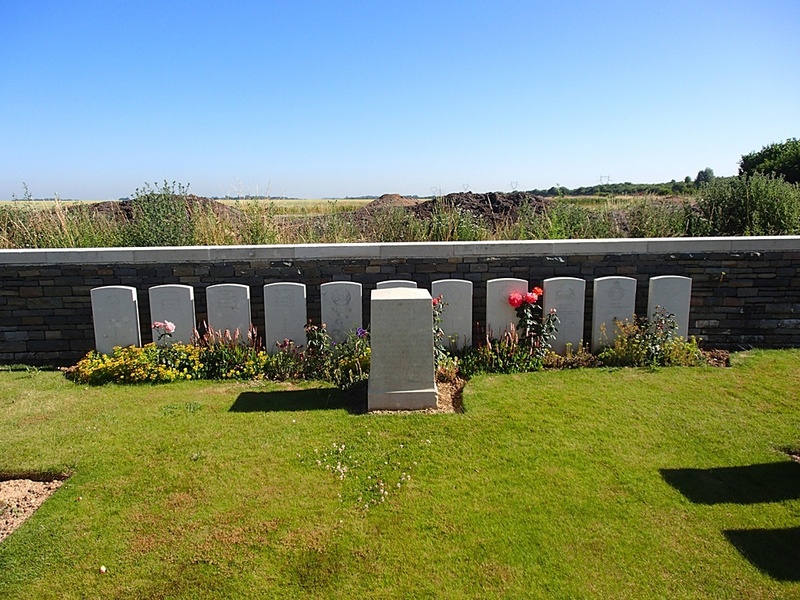 The fenced graves of 846 Lance Corporal Roy Stephen Kenyon MM of Broken Hill, NSW, and 2234 Corporal John Tomich MM of Port Pirie, SA, both of the 27th Battalion, killed in action 29 August 1918, in Assevillers New British Cemetery in front of a building.